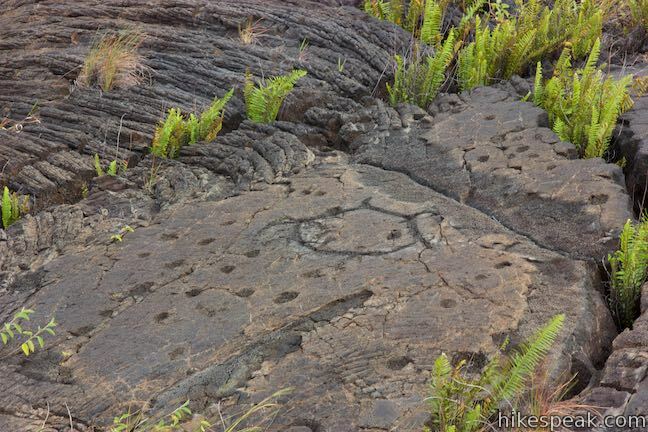 Pu‘u Loa Petroglyphs Trail puts recent geological history and human history on full display. 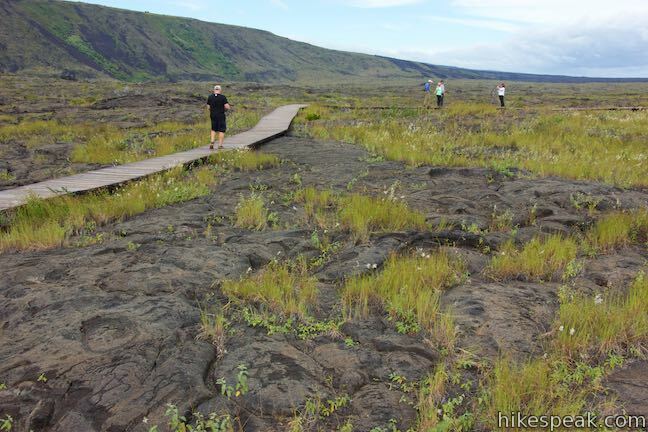 This level 1.4-mile hike crosses a pahoehoe lava flow to a boardwalk loop through an exciting area with thousands of petroglyphs carved by early Hawaiians. 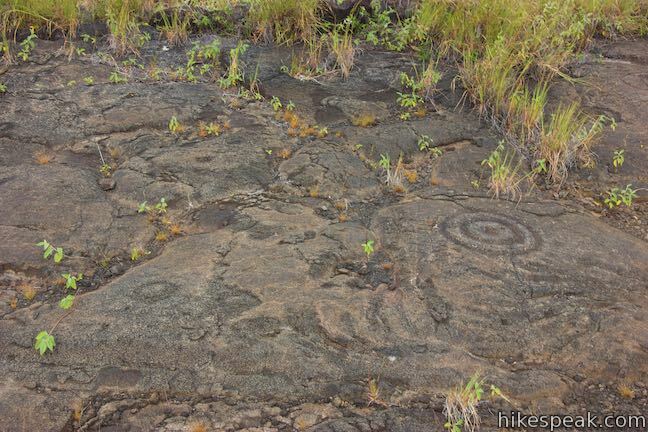 The petroglyphs honor the births of those that lived here hundreds of years ago. 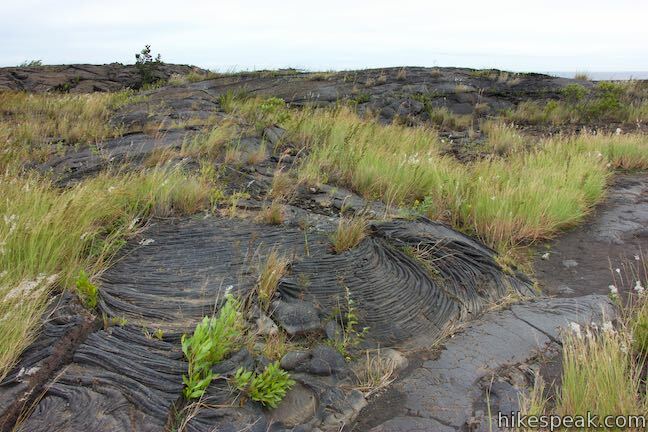 This short trek in Hawai‘i Volcanoes National Park is sure to inspire curiosity in the not-so-distant past. 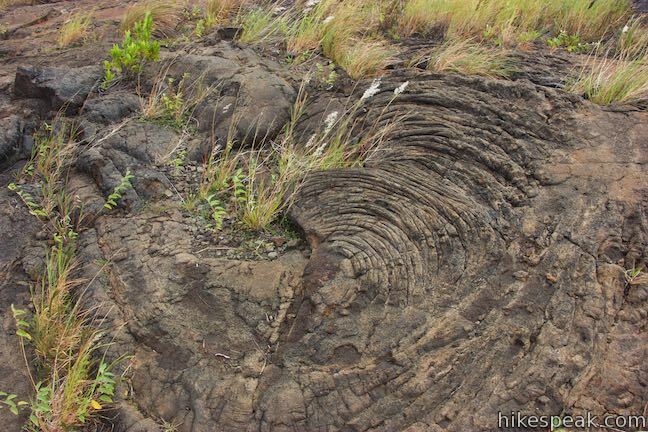 Set within the tapered coastal slope of a smooth pahoehoe lava flow, Pu‘u Loa is a small hill called a volcanic pressure dome. 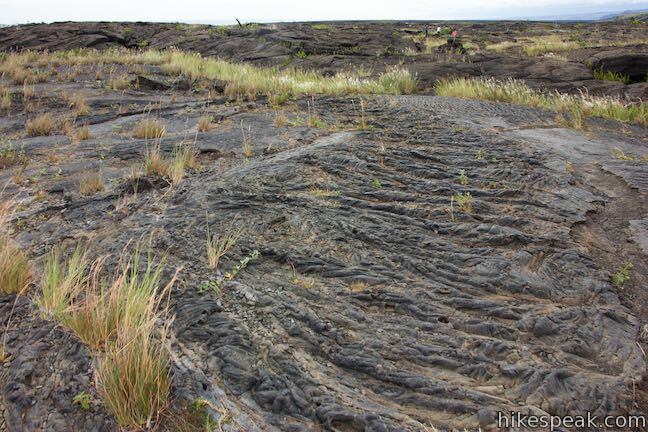 Pu‘u Loa was created during an eruption of Kāne Nui O Hamo, a shield volcano to the northwest, which produced a significant lava flow around 600 years ago, sometime between 1200 and 1450 A.D. 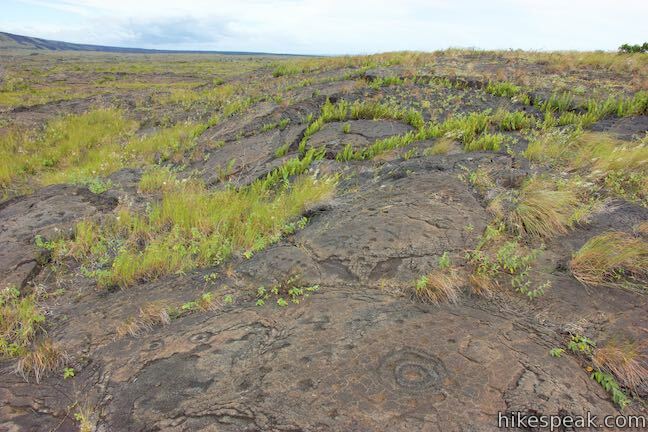 The Pu‘u Loa Petroglyphs were carved with stone tools into the thin, hard crust of the lava flow. 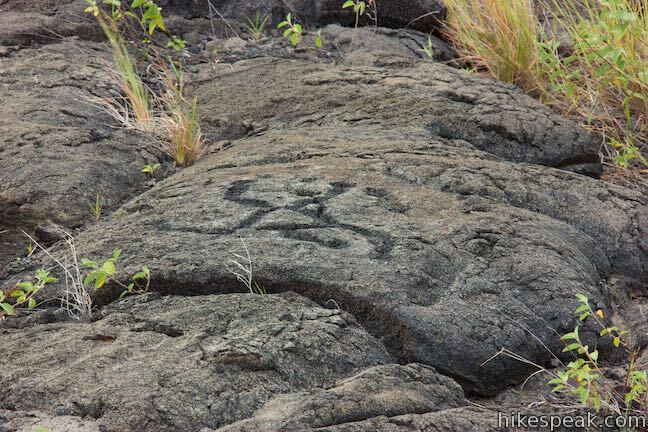 They bore significant meaning for the Hawaiians who carved them. 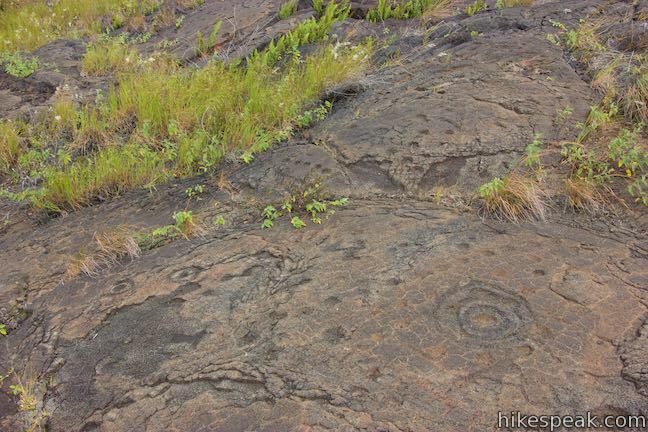 Pu‘u Loa means “hill of long life.” Some 16,000 of the 23,000 petroglyphs at this site served as ceremonial vessels for umbilical cords after children were born. 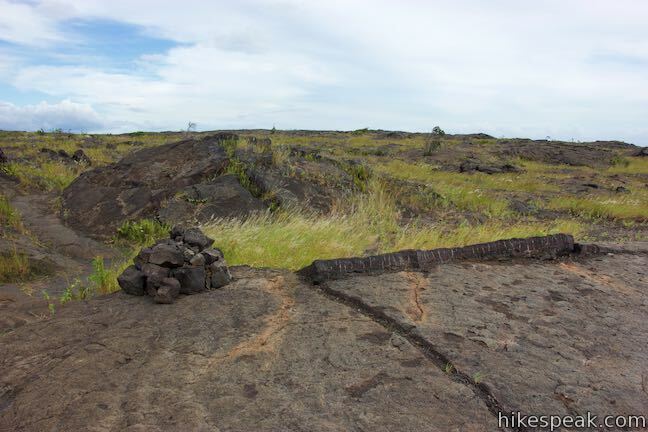 That‘s right – umbilical cords were placed inside carved depressions and then covered with rocks so that the mana of Pu‘u Loa would honor the children with long lives – hence “hill of long life.” The lineage of thousands of Hawaiian families is connected to this spot. 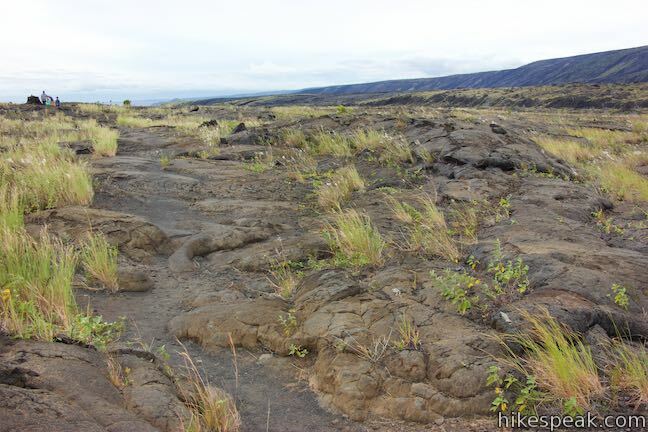 Reaching the Pu‘u Loa Petroglyphs requires a short walk on a single-track trail that ventured northeast from Chain of Craters Road. 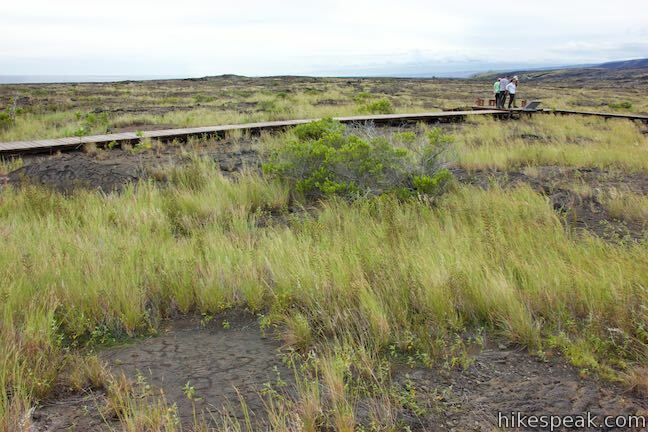 The trailhead is 2.5 miles from the end of Chain of Craters Road by the Hōlei Sea Arch. 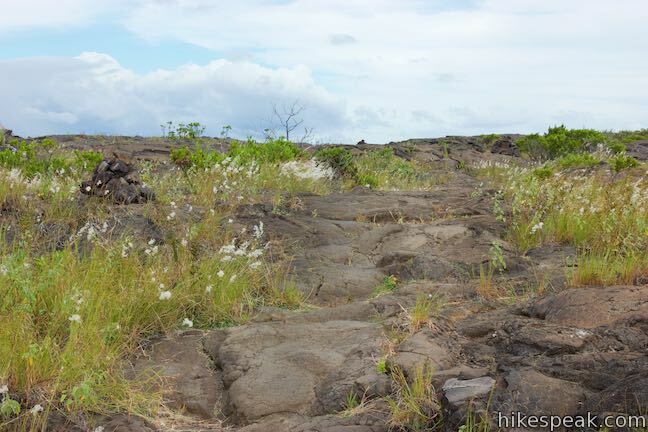 Puna Coast Trail departs from the south side of the road across from Pu‘u Loa Trail. 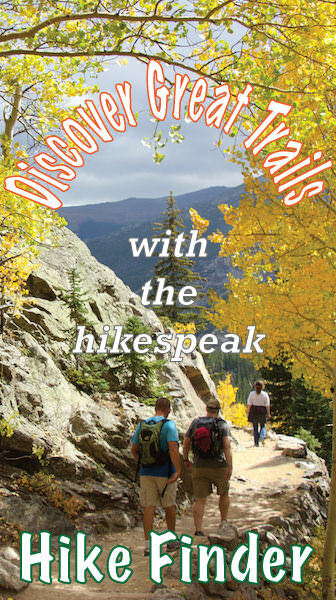 Don’t take this trail (unless you are looking for a much longer hike). 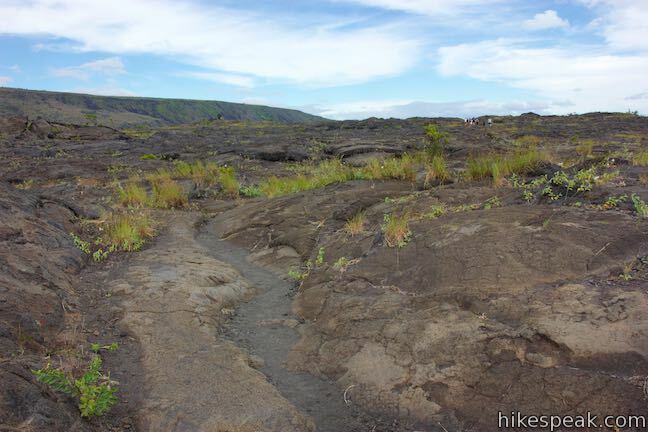 Make sure to set out on Pu‘u Loa Trail from the north side of the road (which will be on your left as you drive down Chain of Craters Road from Crater Rim Drive). 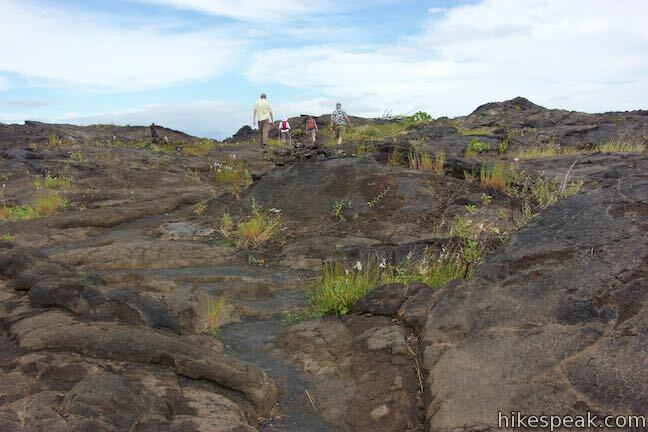 The hike to the Pu‘u Loa Petroglyphs takes you on a mostly level, but gently rolling walk across a pahoehoe lava flow. 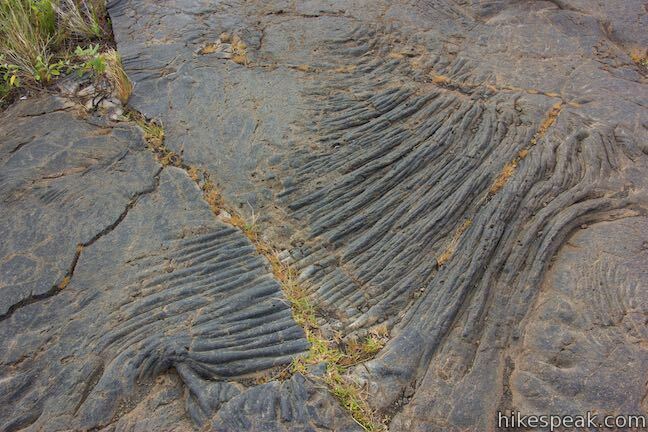 Thankfully for your footwear, pahoehoe is the smooth and ropy type of lava rock, so your passage will not be too arduous. 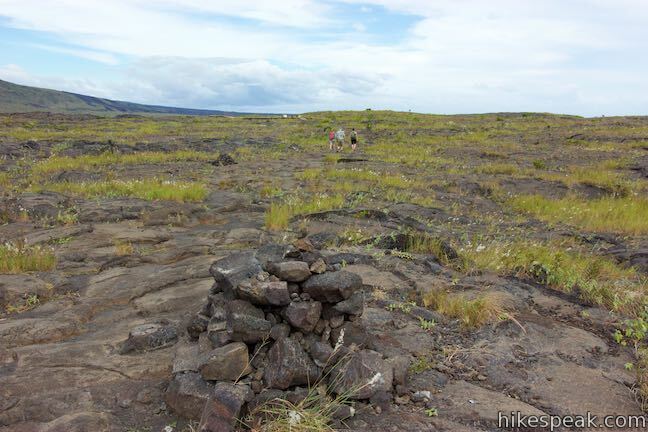 Because the route is sometimes difficult to distinguish from the rest of the volcanic landscape, the path of the trail is marked with periodic rock piles. 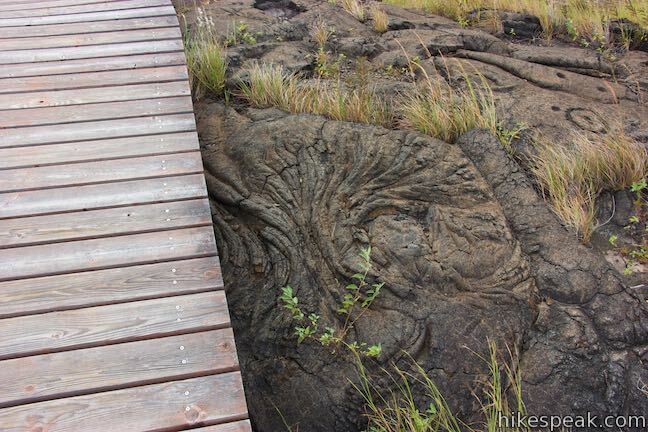 Admire the way the lava formed along the trail. 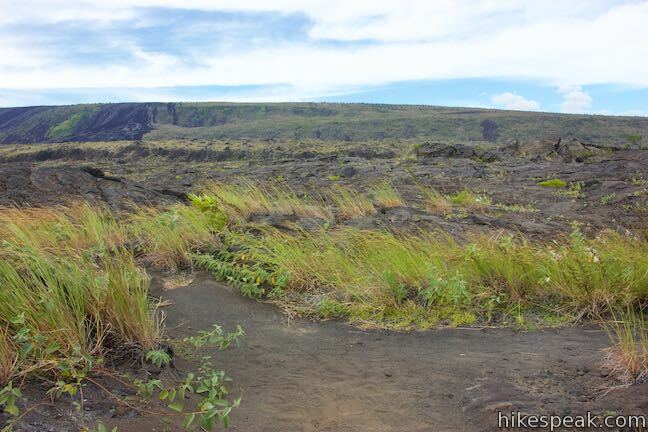 The steep side of Hōlei Pali rises dramatically to the north. 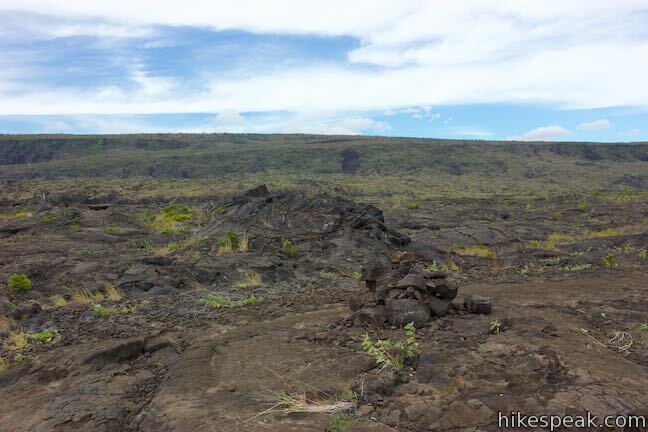 (This is the escarpment of volcanic rock that you drove down to reach the trailhead.) 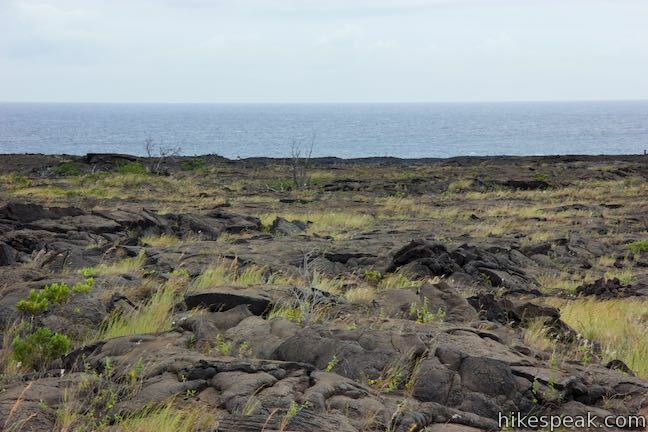 This hike is about 150 feet above sea level, offering glimpses of the ocean to the south. 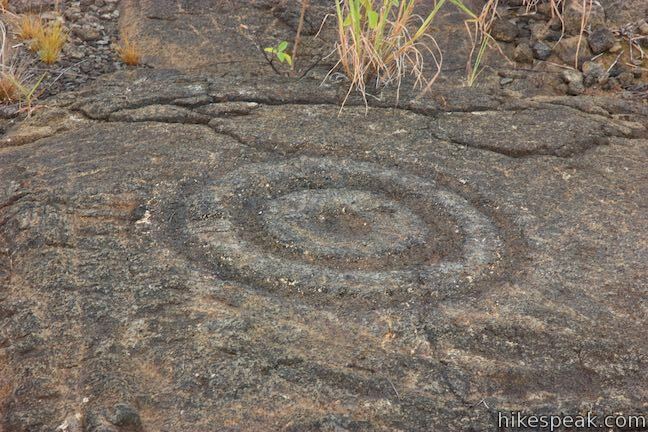 Hawaiians, native to these ahupua‘a (land divisions), lived a sustainable lifestyle through conservation and trade. They survived by living off the land and the sea. 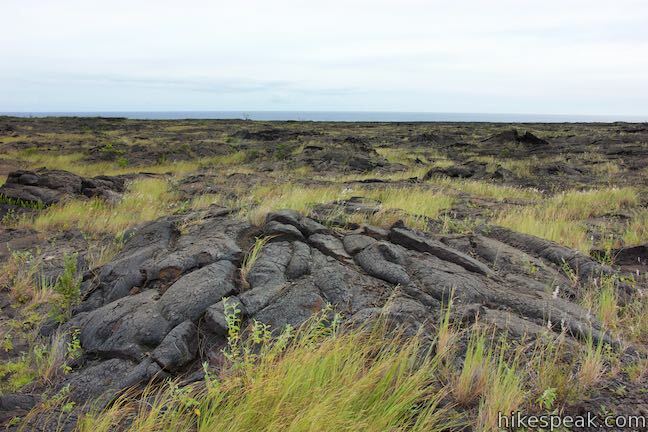 Although the mountains and the ocean provide ample pigs, fish, and other foods, this lava-covered lowland offered minimal soil and fresh water. 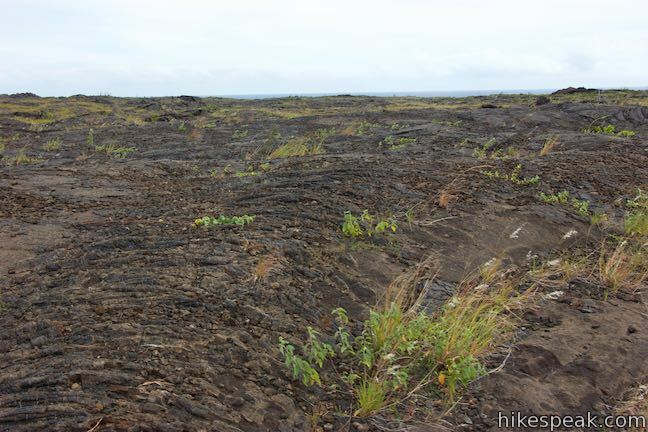 This made the cultivation of the ‘uala (sweet potato), a staple of the Hawaiian diet, difficult. 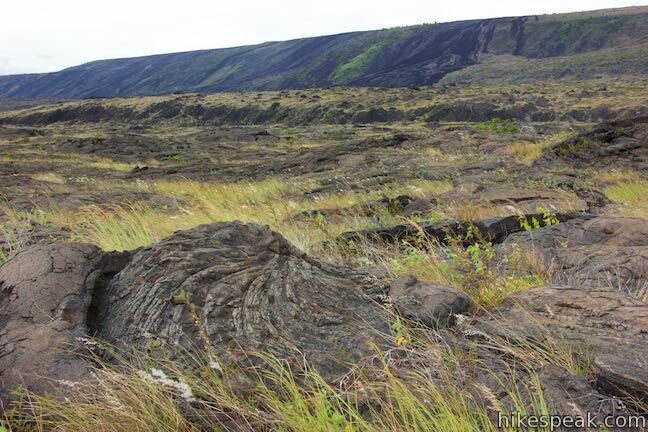 The mahi‘ai (native farmers) created pits and carefully stacked rocks in the sheltered corners of lava flows to cradle the valuable soil and moisture required to grow the ‘uala. These simple sweet potato mounds became their gardens. 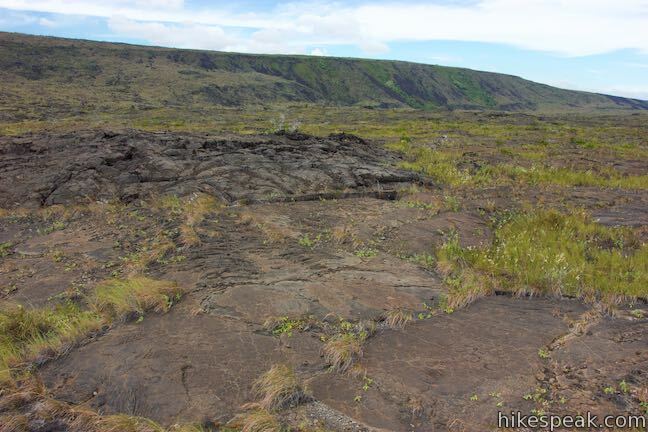 The mahi‘ai nurtured many gardens and controlled the number of ‘uala that could be collected from them. The lives of the community depend upon the diligence, knowledge, and ingenuity. 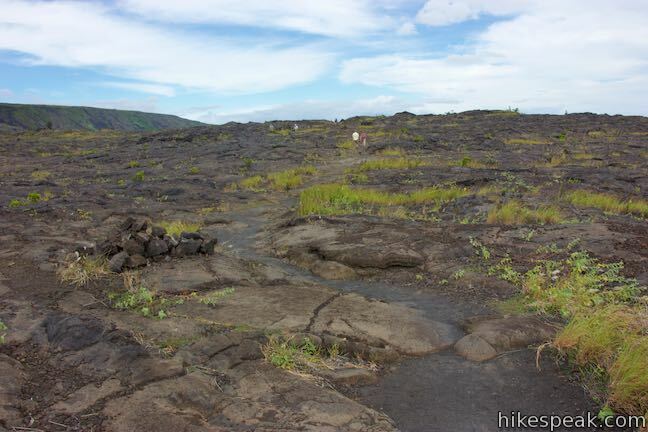 Look at the landscape around the trail. Can you imagine gardening here? 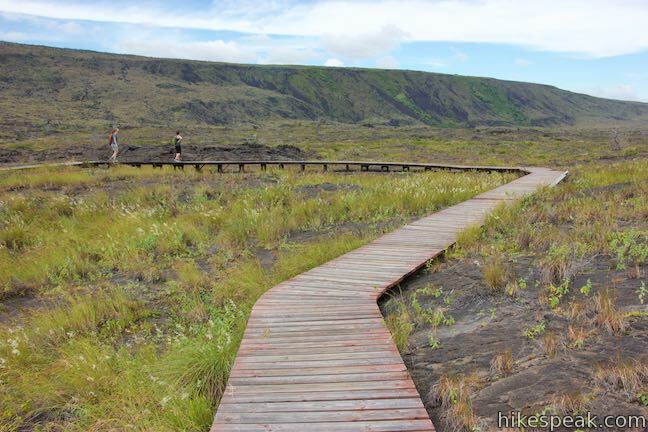 Continue up the trail, admiring the small details in the volcanic landscape around you. 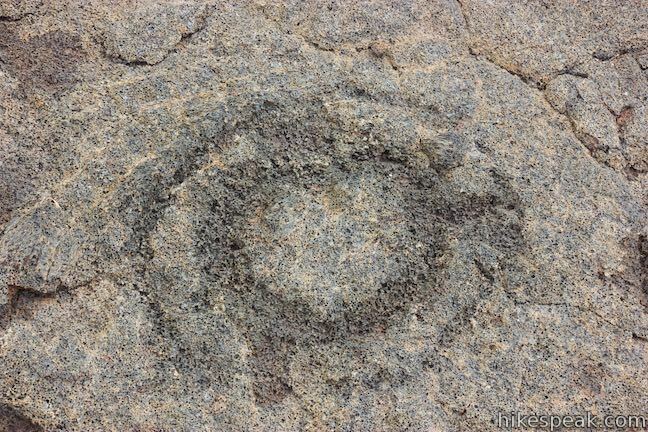 Attentive hikers will start to see circles and other carvings in the rocks. 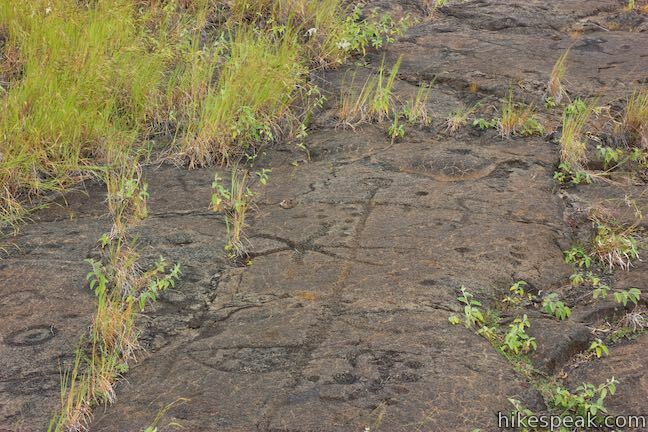 Taking rubbings, or otherwise marring or defacing the petroglyphs is illegal. Leave everything as you find it. 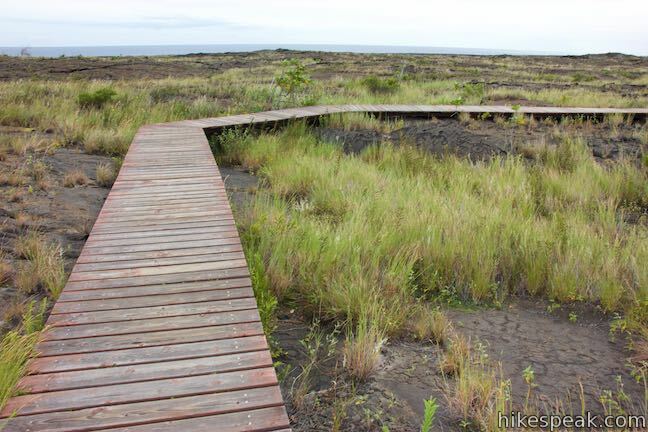 Proceed up the trail to the start of a boardwalk loop, 0.6 miles from the trailhead. A pair of panels along the loop help to answer a couple questions that you might have about the petroglyphs all around the boardwalk. 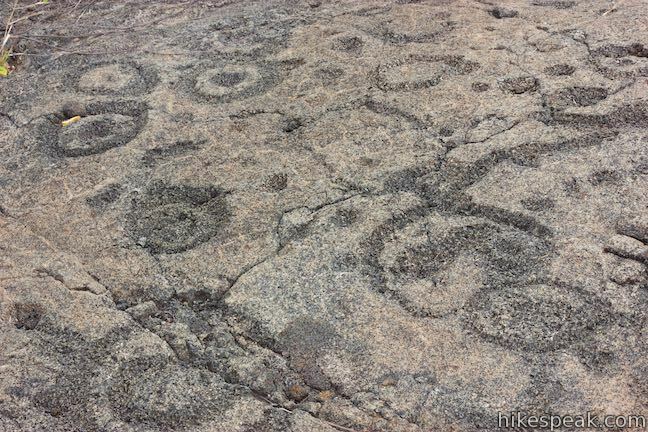 How were the petroglyphs carved? 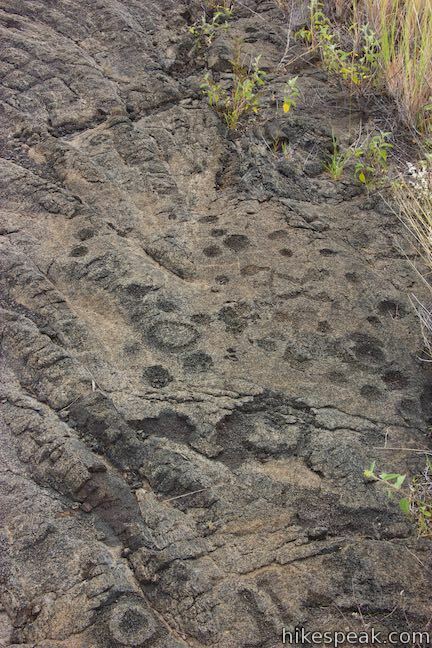 Petroglyphs were traditionally made using Pōhaku (rock). 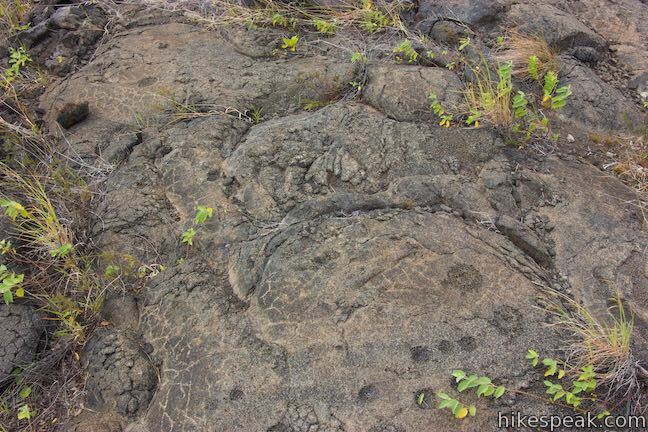 A sharp stone was used to peck or incise precise impressions into the lava surface, while a blunt stone created a bruised or abraded image. 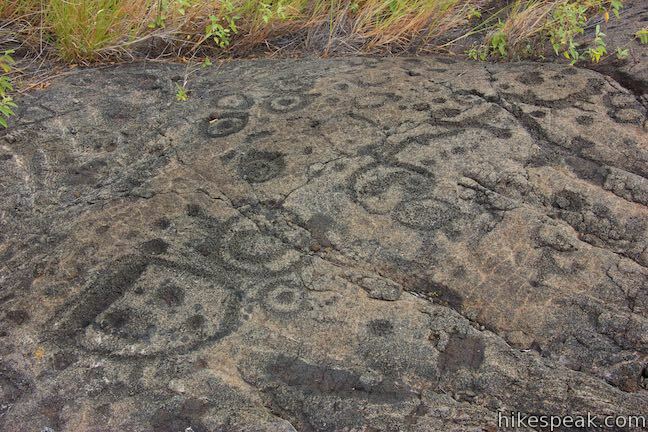 As the culture flourished, petroglyph styles evolved, and the tools used to create them diversified. 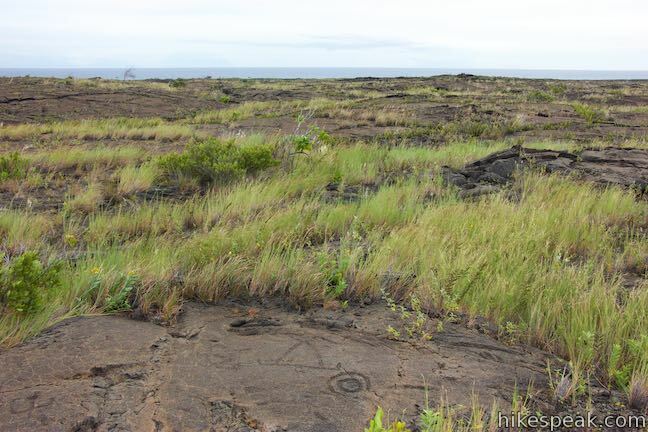 Most recent mapping projects have confirmed Pu‘uloa as the largest petroglyph field in Hawai‘i. 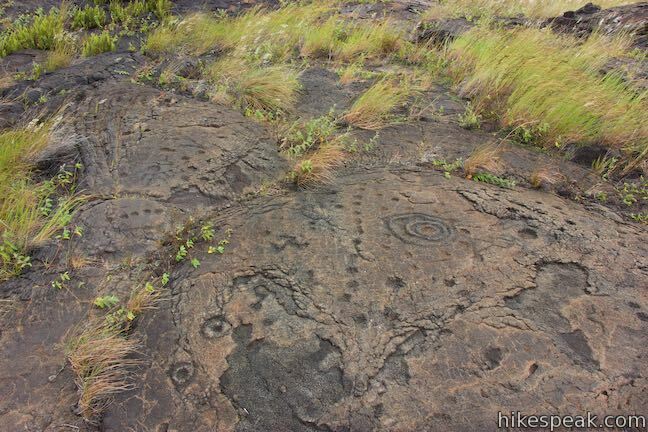 Why were the petroglyphs carved? 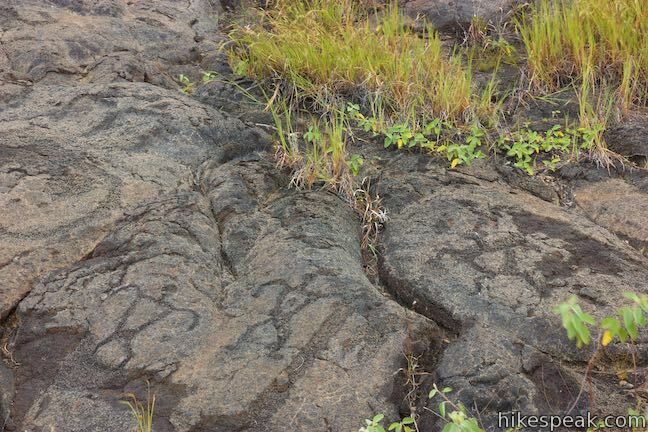 Early Hawaiians did not have a written language, but the petroglyphs show an ability to tell stories through images. Figures resembling people, animals, and tools seem easy to translate into English, while other abstract designs hold hidden meanings. We come to Pu‘uloa because we want what’s best for our keiki (children). Pu‘uloa holds two of my children’s piko. 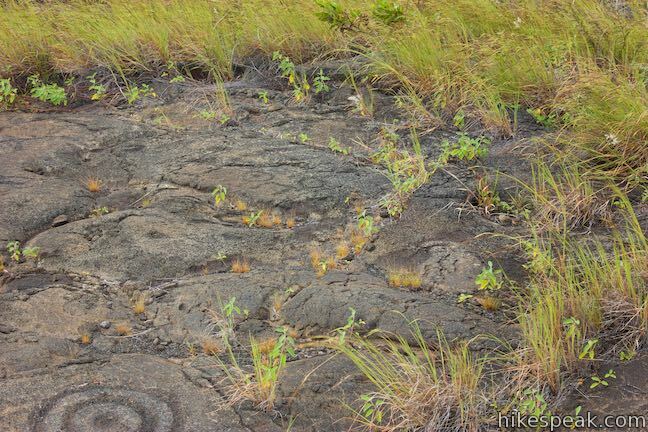 These Kūpuna (elders) brought them here and created the puka where their piko would rest, sealed under a stone. Hawaiian parents like Minnie hoped that the mana of Pu‘u Loa, its spiritual guiding energy, would bless their children with long, full lives. 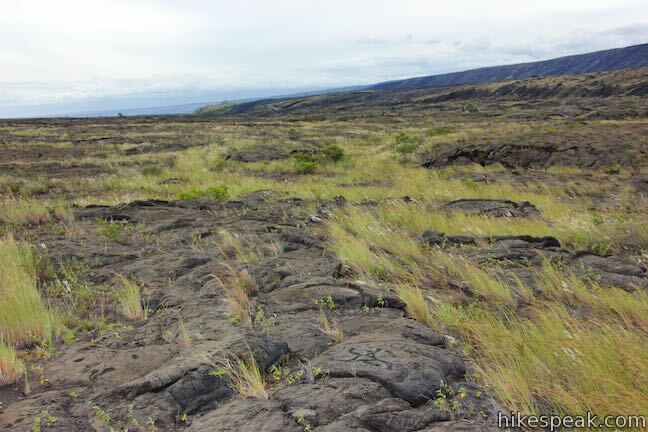 The puka also rooted each child to the ancestral lands. 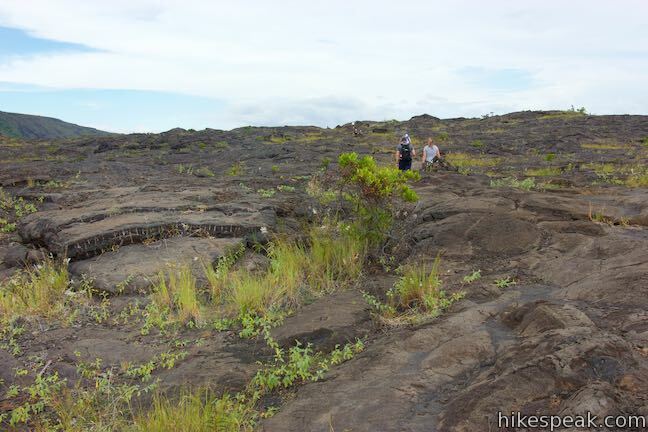 Look around the petroglyph field at the many different puka. Each hole was created to hold the piko of a single child. 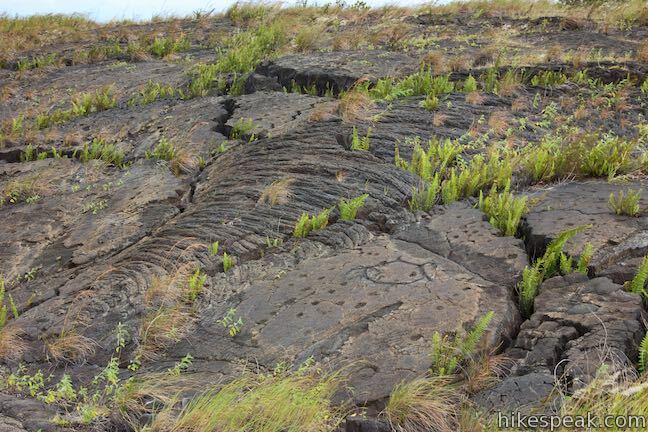 Sixteen thousand piko-related carvings have been counted at Pu‘u Loa. 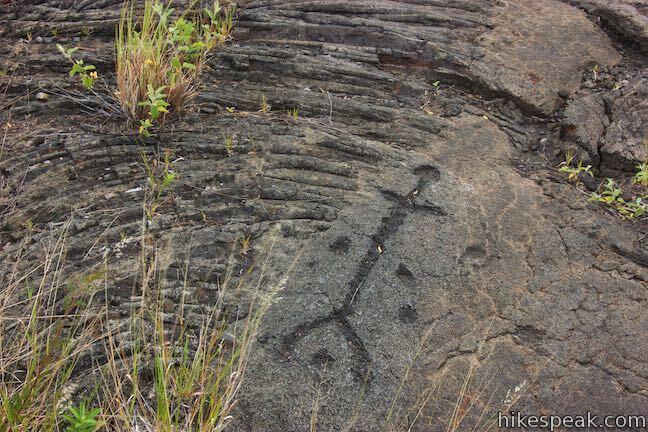 The petroglyph area feels like something-the-opposite-of-a-cemetery, celebrating the beginning of life, while connecting family and place. 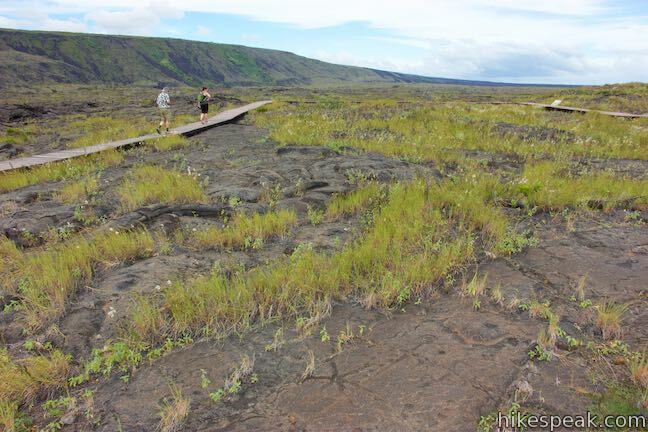 Take the wooden boardwalk on a loop through the Pu‘u Loa Petroglyph Field – a large, dense collection of petroglyphs. 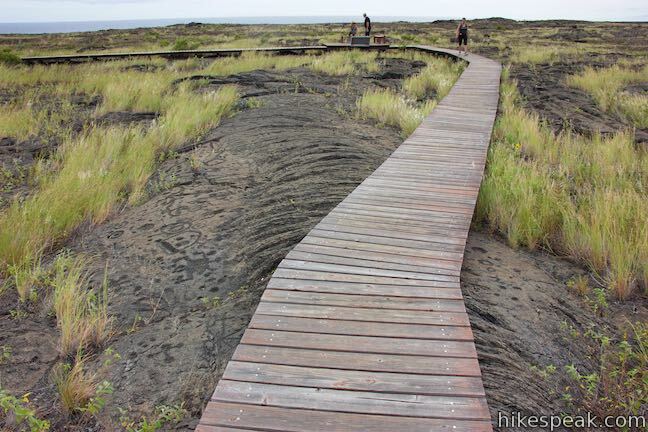 The loop in the boardwalk is 0.2 miles long and can be hiked in either direction. Clockwise seems to be the most popular route. 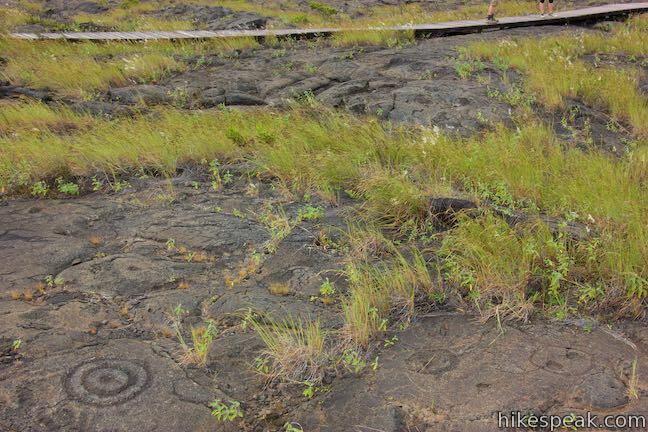 Stay on the boardwalk and do nothing to disturb the petroglyphs. 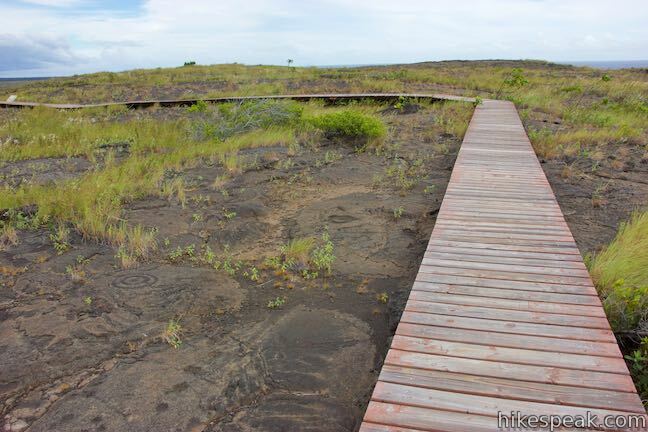 As you circle the boardwalk, notice how the piko puka (depressions for umbilical cords) come in many forms along the path. Some are deeper and some are wider. Some holes are in alignment, while others are wrapped by rings. 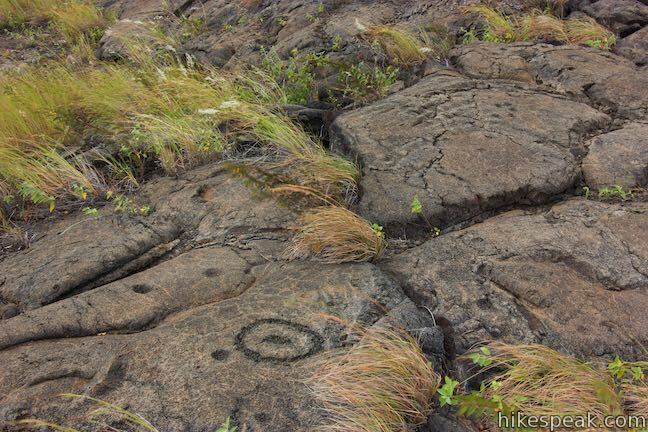 Also among the piko puka are petroglyphs that look like people and others that form mysterious shapes. 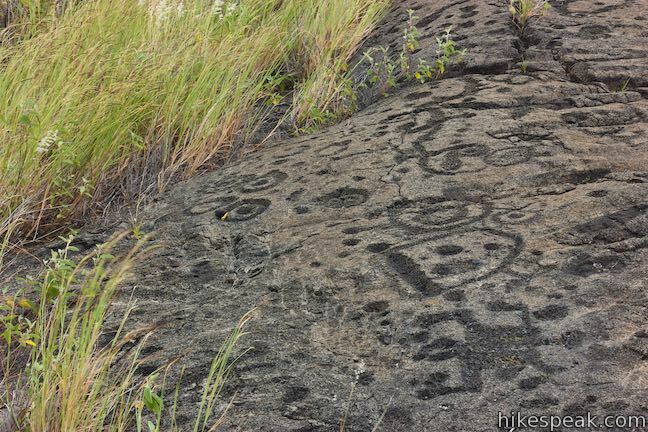 Although much of their meaning may be lost, the significance of the petroglyphs is obvious. Anything carved in stone must have been considered worth preserving. 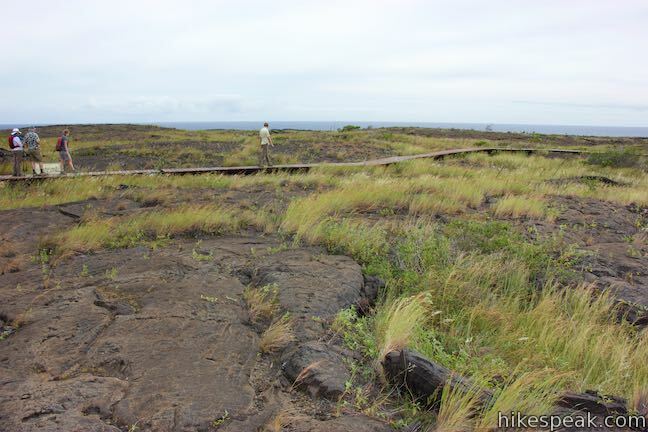 After completing the loop on the boardwalk, and once you’ve taken time to see everything that you came to see, return down Pu‘u Loa Trail. 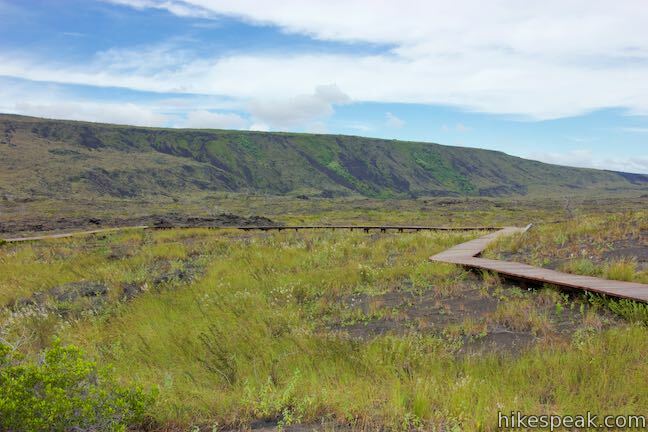 It is a 0.6-mile hike back across the lava field to the trailhead to complete this 1.4-mile hike with 25 feet of elevation change. 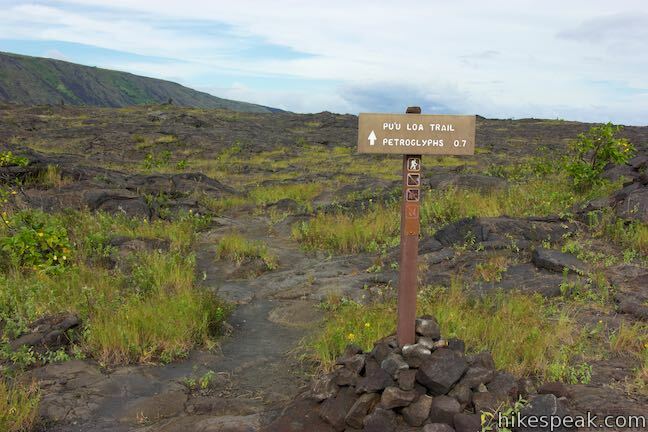 Pu‘u Loa Trail is for hiking only. Dogs, bikes, and horses are not allowed. 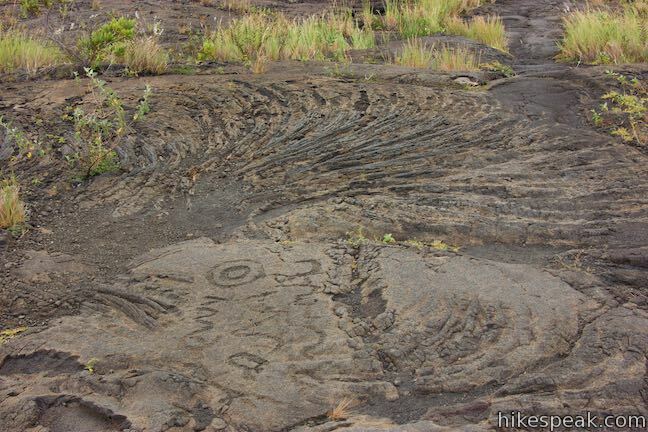 Defacing the petroglyphs in any way is illegal. This is a hands-off hike. 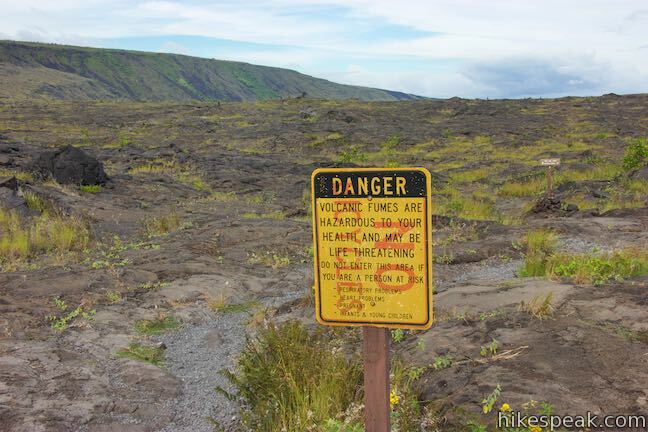 A sign at the trailhead also warns that “volcanic fumes are hazardous to your health and may be life threatening. 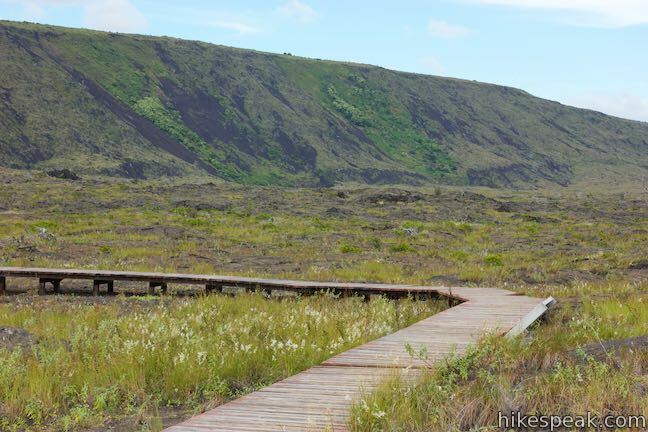 Do not enter this area if you are a person at risk: respiratory problems, heart problems, pregnant, infants & young children.” Those with concerns can get more information at the Kīlauea Visitor Center. 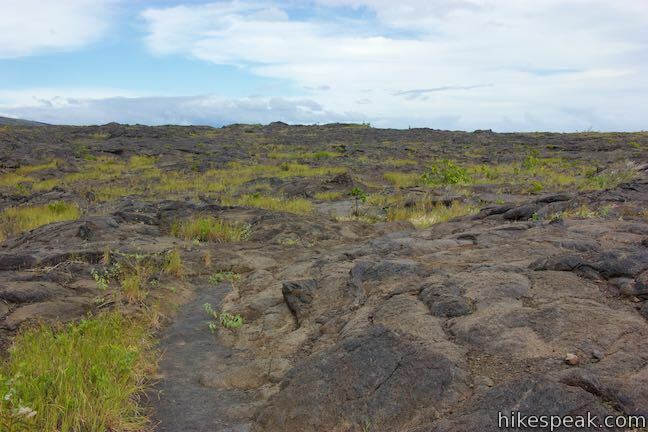 This hike has no shade and may be quite windy, so plan appropriately. 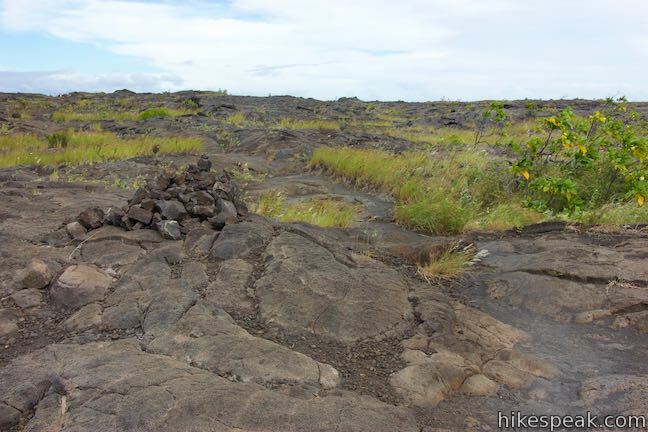 No permit is required for Pu‘u Loa Petroglyphs Trail, but an entrance fee is charged to access Hawai‘i Volcanoes National Park. 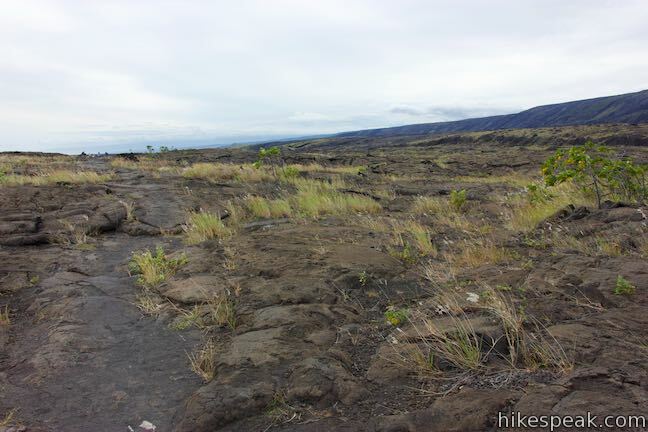 To get to the trailhead: Take Hawaii Belt Road (Route 11) to the entrance of Hawaii Volcanoes National Park (which is 30 miles south of Hilo). 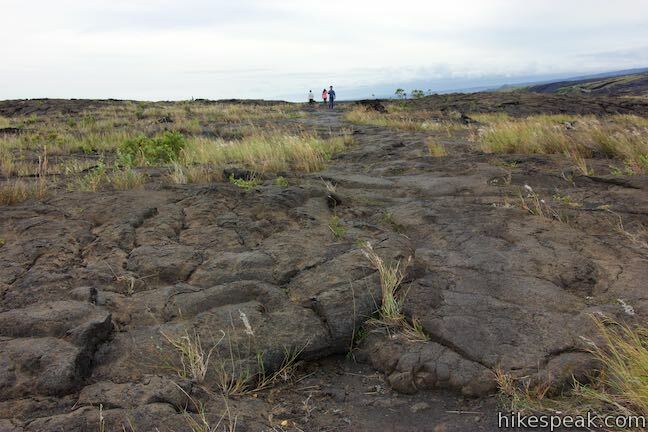 The park entrance is on the left when traveling from Hilo. Drive past an entrance station to the first intersection. 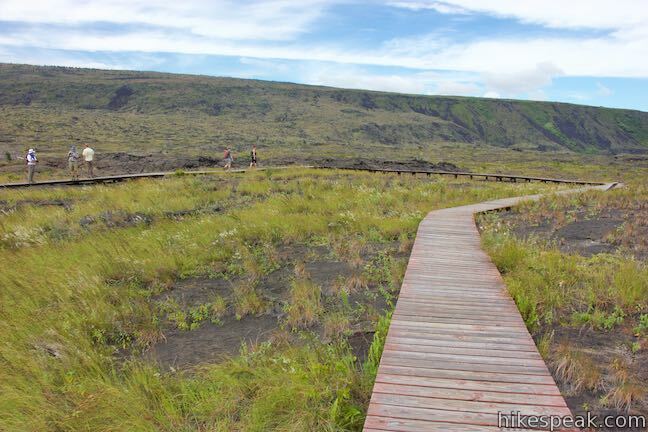 (Kīlauea Visitor Center is just to the right.) 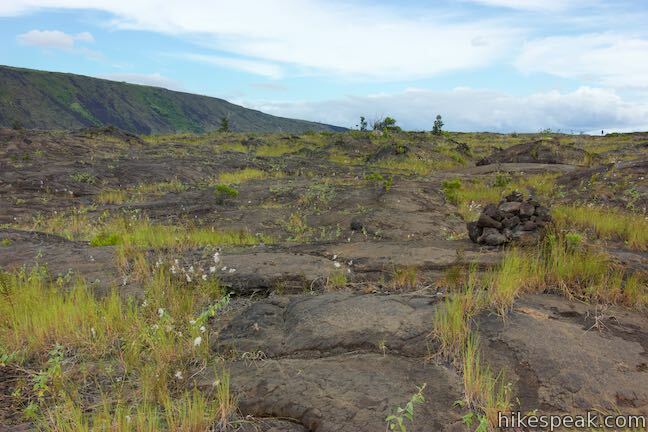 Turn left and drive 3 miles down Crater Rim Drive to an intersection with Chain of Craters Road and the Devastation Trail Parking Area. 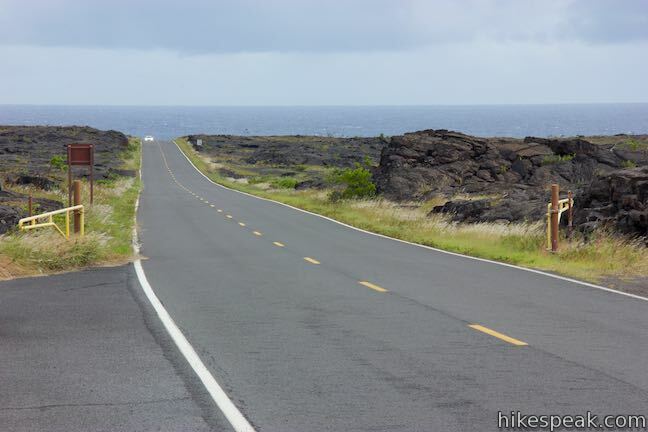 Turn left onto Chain of Craters Road and drive another 16 miles down to the Pu‘u Loa Trailhead, 2.5 miles from the end of the road at Hōlei Sea Arch. 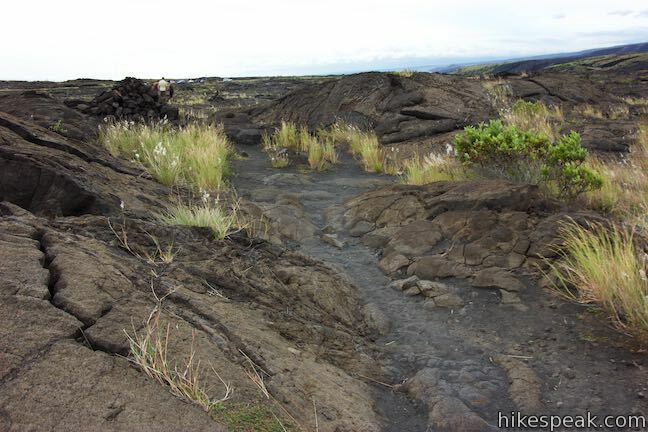 Or view a regional map of surrounding Hawaii trails and campgrounds. These photos were taken in October of 2018. Click to enlarge. 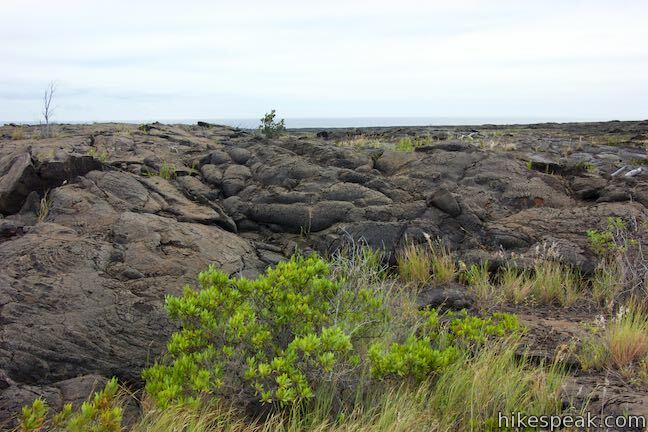 This brief hike in Hawai‘i Volcanoes National Park crosses a basalt bluff to a landmark sea arch extending into the ocean. This 0.2-mile hike around Rainbow Falls Lookout explores a viewpoint facing a lovely waterfall and also ventures up to the top of the falls. 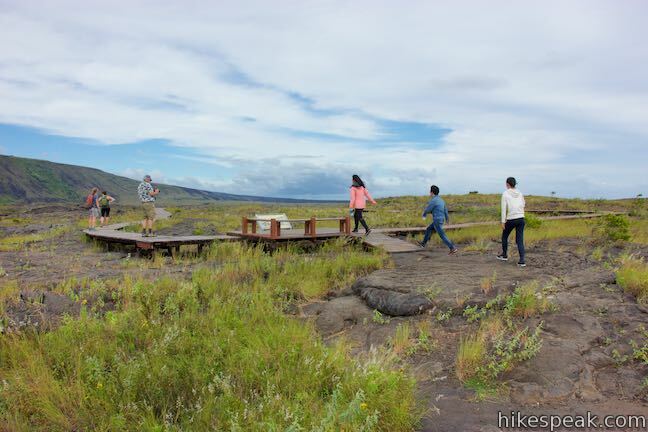 This underground hike explores lava tubes on the edge of Hilo, created by an 1881 eruption of Mauna Loa. 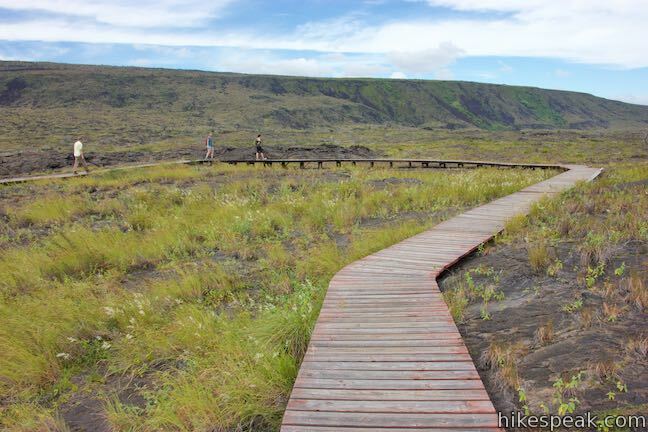 This short loop slips through a tropical valley to bold views of a 442-foot single-drop waterfall. 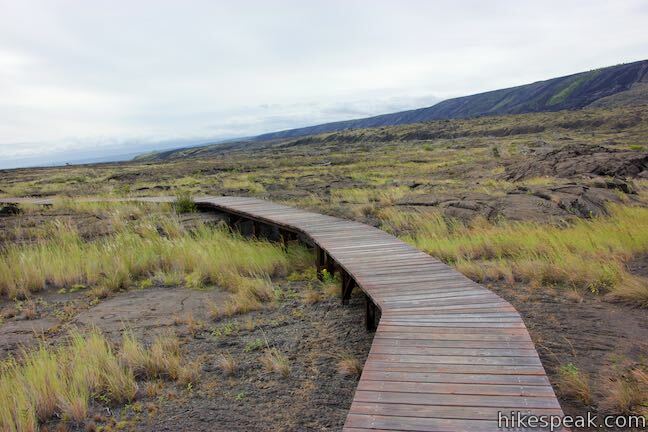 This half-mile loop on the coast south of Kona explores Hawaiian royal grounds and a place of sanctuary in Pu‘uhonua O Hōnaunau National Historical Park. 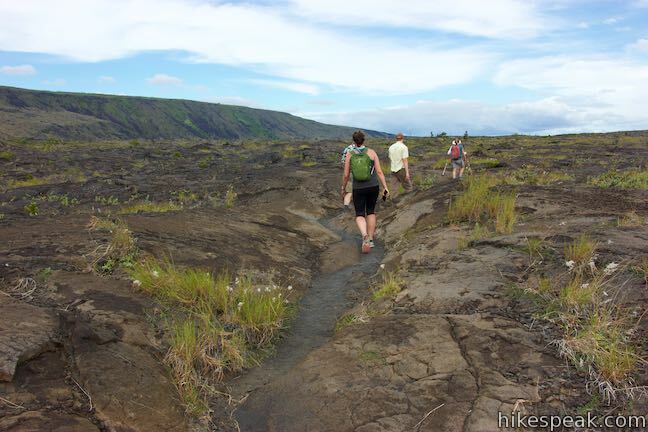 Explore more hikes on the Big Island of Hawai‘i. 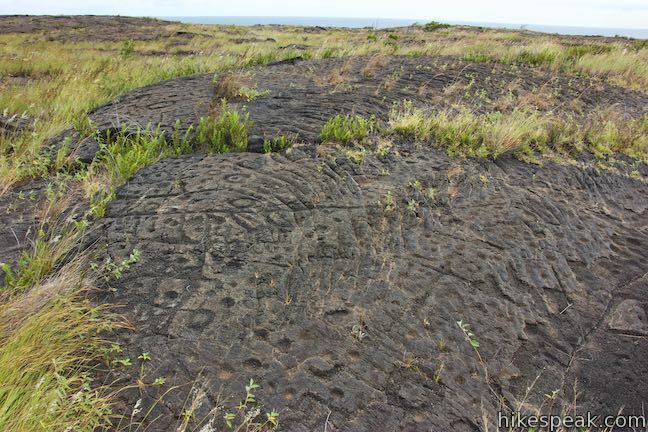 This 0.2 to 1.2-mile hike visits an area of rare rock carvings on the west coast of the Big Island of Hawai'i. 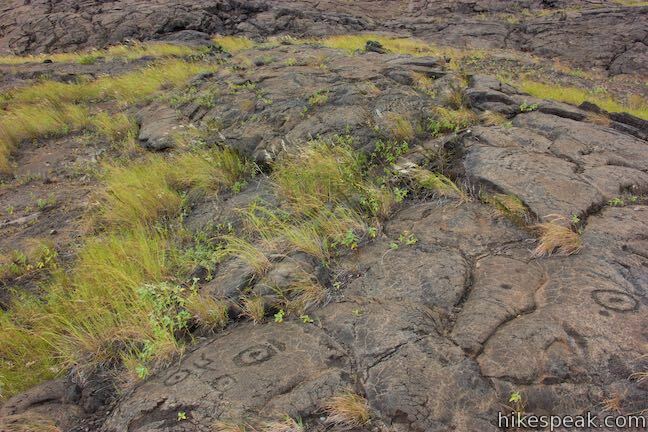 This quarter-mile path visits ancient engravings in the volcanic rock at the western rim of the cinder fields just off Kelbaker Road. 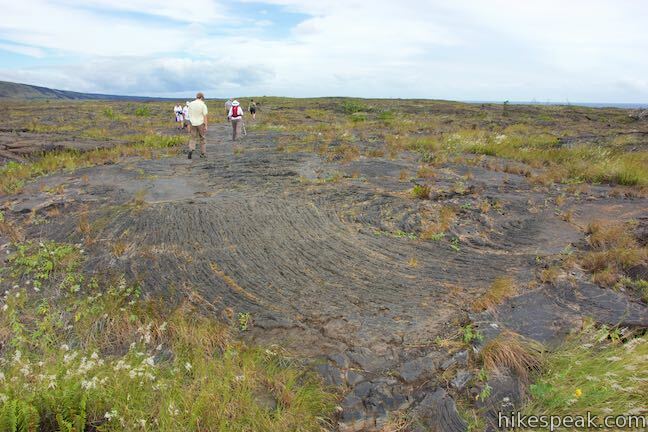 This 0.75-mile hike travels down a sandy path lined with petroglyphs to a natural basin formed in the sandstone. 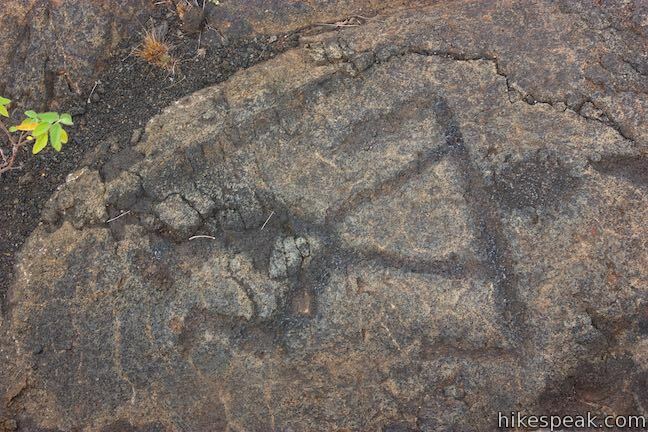 Step right up to see Native American rock art on this 0.1-mile trail with stairs up a rock face to a collection of petroglyphs. 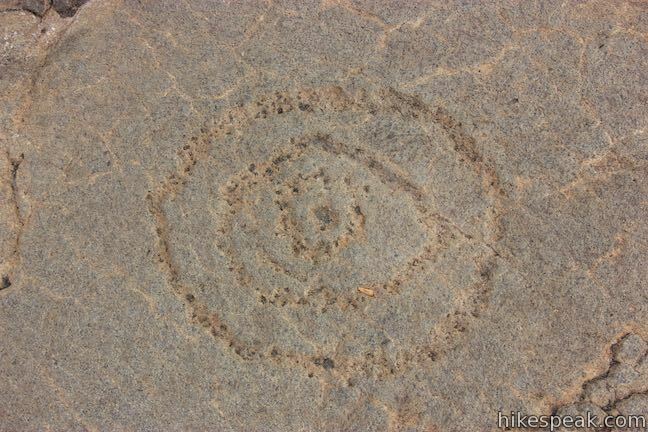 This 1.8-mile hike visits rock paintings drawn by Kumeyaay Indians who lived in the Anza-Borrego Desert thousands of years ago. 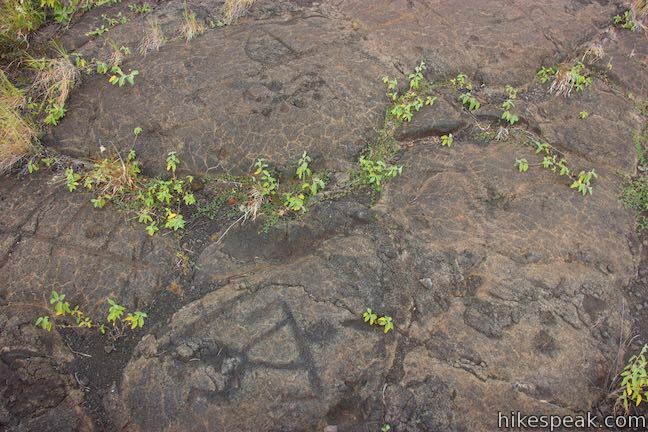 This level 1.5-mile loop visits a foreign-looking reservoir and petroglyphs engravings within the Wonderland of Rocks.